Net Impact Philadelphia is partnering with several leading finance organizations in Philadelphia to host a Community Finance Panel. Representatives from Local Initiatives Support Corporation, Opportunity Finance, Federal Reserve Bank of Philadelphia, and Nonprofit Finance Fund will engage in an interactive panel discussion around social finance issues and how they relate to Philadelphia. Tickets are free so register today! Net Impact Philly gathered members for a tour of Evil Genius Beer Company to hear all about their sustainable initiatives, combined with happy hour and networking. Net Impact Philly held a panel where members heard from Campbell's, The Food Trust, and Reinvestment Fund about "The Grocery Gap". They learned how the worlds of non-profit organizations, for-profit corporations, and public policy intersect to improve food security in high-need communities of Philly & beyond. 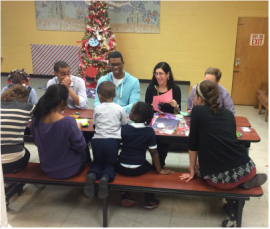 Net Impact members shared a meal at The EAT Café to learn about innovative ways to address access to healthy eating. Net Impact Philadelphia and ImpactPHL teamed up to offer a networking dinner at Gran Caffe L'Aquila. We took some time to destress before the holidays by meeting up for happy hour at Fergie's Pub. We held a Quizzo event during the national conference on November 3rd. NI members from all over the country came together to mingle, test their knowledge, and win some prizes! Net Impact Philadelphia was one of over 150 vendors at Greenfest Philly in September 2016. Attendees were able to learn about our organization and many other local groups while participating in demonstrations and listening to live music. We celebrated our second consecutive year of achieving status as a Gold Professional Chapter at the PHS Pop-up Garden. 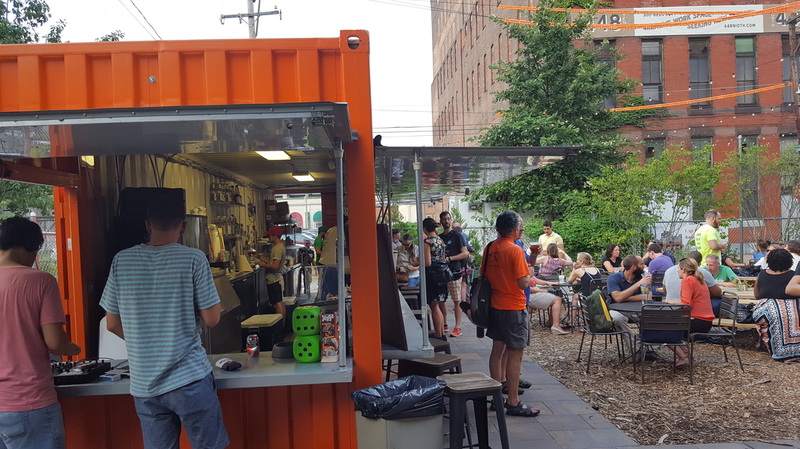 The Philadelphia Horticultural Society (PHS) shared the story behind the pop-up gardens and Net Impact members and friends enjoyed food, drinks, and the scenery. Net Impact Philadelphia and Young Professionals in Energy hosted a happy hour for energy and sustainability professionals to come together at Independence Beer Garden. Net Impact Philadelphia and UPenn/Wharton's Social Impact Club hosted a panel discussion on GMOs, labeling, and what's next for the food industry and consumers with Dave Stangis, VP of Corporate Affairs and CSR of Campbell Soup Company, and Natalie Hubbard, Director of Regulatory Affairs at DuPont, Phyllis Rubin of GMO Free PA.
Delaware Valley Green Building Council and Net Impact Philadelphia Professional co-hosted a networking happy hour after the Tri-State Sustainability Symposium. We held our second topic-driven Philadelphia No-Host Dinner at Nomad Pizza to discuss Corporate Social Responsibility (CSR) and Community & Economic Development. 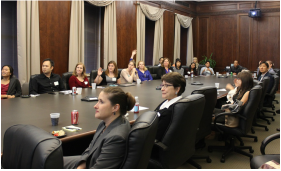 We kicked off the new year with our annual Net Impact member and networking meeting. In addition to catching up with old friends, the Board provided a 2015 year end summary, plans for the upcoming year, and details on how to get more involved, including becoming committee and board members. For our last Net Impact event of 2015, members got into the spirit of giving by volunteering at the Jane Addams Place, a homeless shelter associated with Board Fellow Participant, Lutheran Settlement House. They created holiday decorations with the residents to help bring them some holiday cheer. ​The Board Fellows program matches Net Impact members with a nonprofit board for a one-year fellowship that involves working on a strategic project for the board. Attendees met some of the amazing nonprofits operating locally and gained insights into the challenges these organizations face. Board Fellows described how they tackled their assignments, and what worked and didn’t. Sponsored generously by Obermayer Rebmann Maxwell & Hippel LLP. 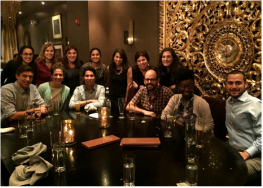 No-Host Dinner: How Do I Bridge My Job to My Passion? Borrowing from the series of topic-driven No-Host Dinners from the annual Net Impact conference, we held our own Philly No-Host Dinner. 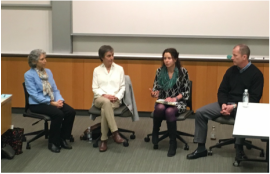 NI Philly members from various stages of their careers, including those in "impact" fields of Sustainability & Non-Profit Management, discussed their experiences on bridging "traditional" jobs to a high-impact career. 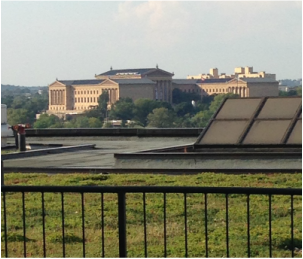 Attendees discovered the city like you have never seen it before: the PECO green roof tour led by PHS, offers stunning views of Philadelphia, an observation deck and an "intensive" area featuring large planters. Share with us this unique opportunity to discover the 45,000-square-foot green roof at its Center City Philadelphia headquarters. 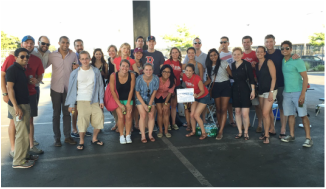 We celebrated the 2nd year of our Chapter's Gold status achievement at a Phillies game and tailgate. Everyone enjoyed great weather, cold drinks, and delicious food hot off the grill. Casual gathering to celebrate our Mother Earth happy hour style. Net Impact Philly enjoyed a tour of Flying Fish Brewery complete with beer sampling and a take home souvenir glasses! On September 21, Net Impact Philly met at bgood in Marlton to learn about how fast food dining can be fresh, local, and delicious! Franchise owner, Deb Lutz, spoke to us about the concept behind bgood and how the business model can serve as an examples for others in the fast food industry. We enjoyed free smoothie and fries samples while supporting this healthy, local business! On Saturday, June 21 Net Impact Philadelphia joined Philabundance, the region's largest hunger relief organization, for a volunteer day. 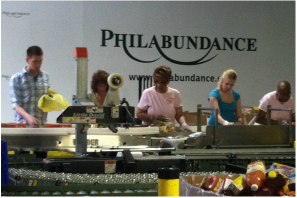 Philabundance has been serving our area since 1984 and operates on one simple belief- that no man, woman, or child should go hungry. 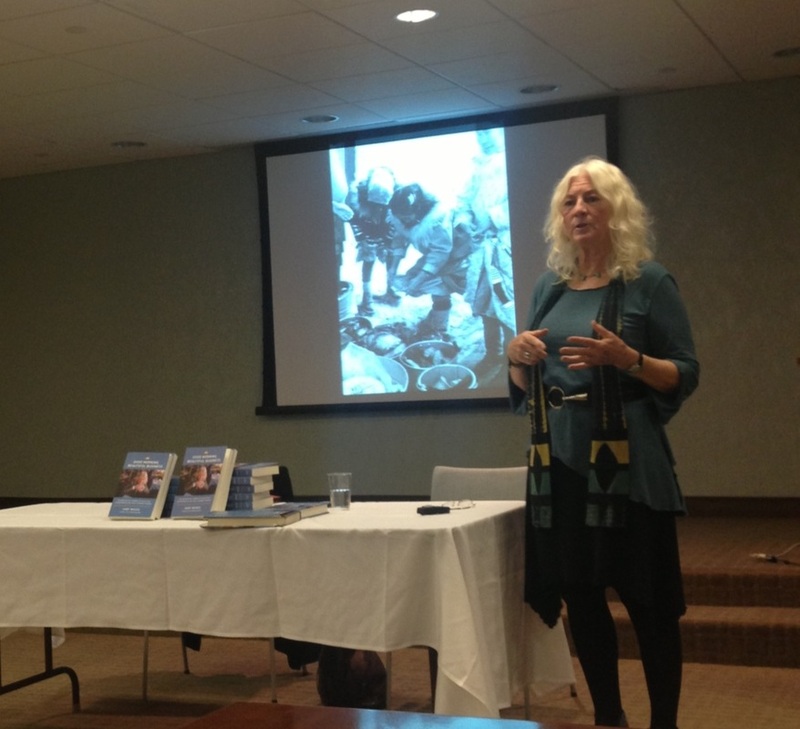 Judy Wicks, entrepreneur, activist, and author working to build a more compassionate, environmentally sustainable and locally based economy discussed her work with us. She founded several non-profits including Fair Food Philly and the Sustainable Business Network of Greater Philadelphia, and cofounded the nationwide Business Alliance for Local Living Economies (BALLE), a network of 30,000 local independent businesses in 80 communities. Check out her memoir, Good Morning, Beautiful Business: the Unexpected Journey of an Activist Entrepreneur and Local Economy Pioneer. Special thanks to Schnader Harrison Segal & Lewis LLP for donating the space for this event. On March 27, Net Impact Philly joined with representatives from the field of social enterprise including representatives from B Lab, Good Company, The Reinvestment Fund and Investor Circle. We learned about triple bottom line business models and participated in a discussion about the state of the #socent industry. Thanks to Sustainability Nexus for donating the space for this event. Net Impact learned about food deserts and issues of healthy food access. 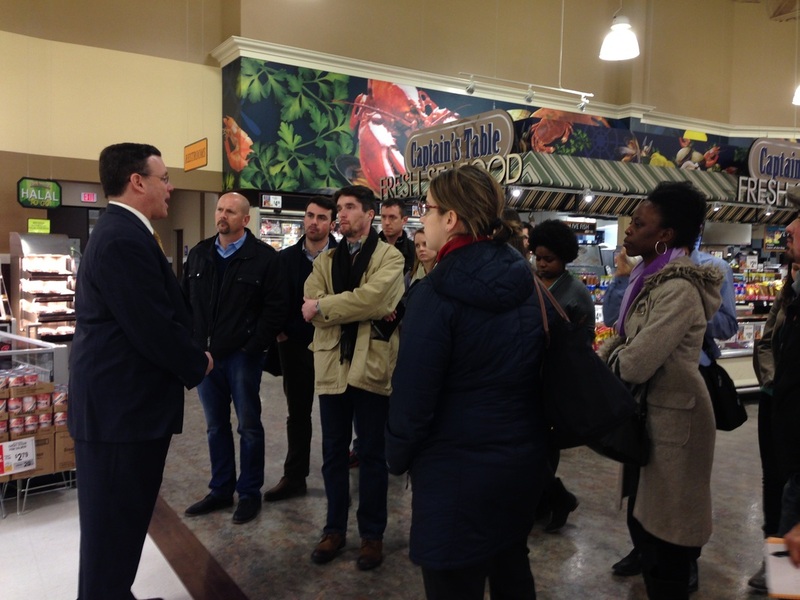 The event at the ShopRite of Fox Street included an informative tour led by Jeff Brown, a Philadelphia grocer who is nationally recognized for using entrepreneurial solutions to address social problems through innovative supermarkets. The tour was followed by a panel with local nonprofit organizations expanding access to healthy food and working to improve our nation's food system. Speakers from UpLift Solutions, The Food Trust, and Philabundance shared updates about their work and national trends in the fight to eradicate food deserts. Special thanks to Brown's Super Stores for donating food served at the event. Thanks to those of you who came out for the Yards Brewery Tour. It was fun learning about this local, sustainable business while getting to know each other better and enjoying some tasty beer! Photos of the event can be found on our facebook page. 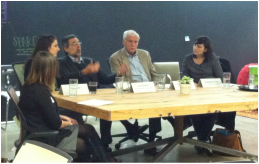 If you missed the event, check out member, Len Zangwill's blog recap. Want to share an event with Net Impact Philadelphia members? Contact Us!